I have not been blogging on WordPress for very long, but one of the things I made sure to learn quickly was how to do a hyperlink in my posts. The reason for this is probably obvious to most people, but there are some who don’t even realize what a hyperlink is. For those of you who fall into that category, I’ll explain it now, so that never again will you be able to say that. A hyperlink is a word, phrase or string of characters that, when clicked on, will cause your browser or app to take you to a different place in the document, open another document, or navigate to another website on the internet. The web address or path will not show unless you look for it. It is hidden behind the text of your document, if you will. 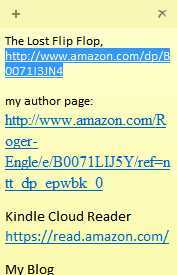 What I mean is this: If I want people to see the words “The Lost Flip Flop by Roger Engle” and be able to click on those words and go directly to the website, (http://www.amazon.com/dp/B0071I3JN4), where they can buy my new short story. 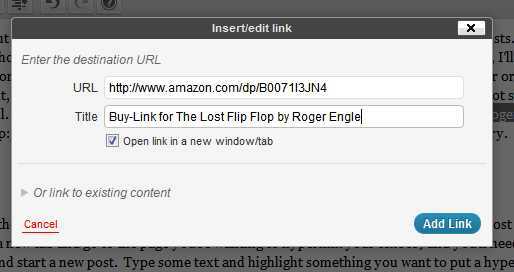 I should put a hyperlink behind the words “The Lost Flip Flop by Roger Engle”. Now we’re getting down to the nitty-gritty. You’ll need the web address or the path of the place you want to go, (I keep a bunch of my most common links on a post it note on my desk top. Onenote also works, or just open a new tab and go to the page you’re wanting to hyperlink your text to) and you’ll need some text to work with. So before we start this, open your blog on another tab and start a new post. 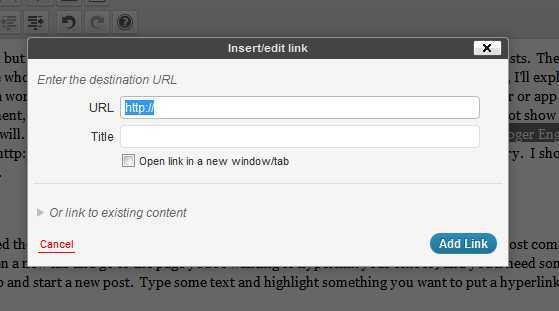 Type some text and highlight something you want to put a hyperlink in. Next, you’ll need to highlight the address I told you to get ready, the one to which you’re planning to hyperlink your text. (Be sure to include the “http://” part of it.) Once it’s highlighted, copy it. You can use ctrl+c or use the right-click menu to copy it. Now we’re going back to the post edit page and verify that our text is still highlighted. If it’s not we need to highlight it again. Then we go to the top of the editing window and look for the little square button with a picture in it resembling a chain’s links. That’s the hyperlink button. Click it. It’s going to open a hyperlink editing “wizard” that looks like this. When you open the wizard it will already have the "http://&quot; highlighted. I always try to remember to have it open in a separate tab or window so the person reading my blog will be able to return there by clicking on the tab instead of having to remember the website it was on and navigate back there. Now when you publish your post, click on the colored text and it should take you directly to the address or site you linked it to. Have fun doing hyperlinks. Please comment here if you like this article or have any questions. What a good idea to post this – from experience with my basic “How to” posts about Word, I know this will be appreciated. Are you getting lots of hits from search engines? I have not gotten a lot of search engine hits yet. I am looking into how to arrange for that, but I think it has to do with metatags and SEO, which I don’t understand very well yet. I know this, It requires a focus on the subject of the post or page in all the text, and I am not good at focus, which is why I’ve only written short stories and poems up till now. Maybe you have more knowledge about this and could post a tutorial or something. Maybe you already have. Let me know. I noticed this website, about creating a good hyperlink campaign, featured my “How To” post as a related link. I think the article could have been written a little better, but I don’t know the author. It’s possible that English is not his or her first language, and in that case, he or she did fine. I haven’t yet gotten into “marketing” my blog heavily, and I don’t really ever know that I will, but I guess if I was to get into it, this article would be of some use. Thanks for the reference link.